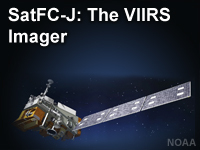 This lesson introduces the VIIRS imager on board the Suomi NPP and JPSS satellites. The lesson briefly describes the capabilities, improvements, and benefits that VIIRS brings to operational meteorology. Numerous images are shown that demonstrate a variety of applications available in the AWIPS weather display system. This lesson is part of the Satellite Foundational Course for JPSS (SatFC-J).